Julie Krupnick looks to pass the ball. The redshirt freshman was named Big Ten Freshman of the Week after she collected 45 saves in four games. Sheila Nesselbush sensed something needed to change. Northwestern, then ranked ninth in the country, was fresh off an 18-13 loss to then-No. 4 North Carolina on March 17. It was their second loss in three games, and the Wildcats were heading into a Spring Break stretch that included two road trips and three games against ranked opponents. The senior attacker knew it was time to lock in. NU (9-3, 2-0 Big Ten) went on to sweep the Spring Break schedule, collecting four straight wins and moving back into the Top 10 for the first time since the loss to the Tar Heels. The hot streak hits as the Cats head into their final five games of the regular season. NU will look to boost its resume even more this week, facing Ohio State (5-6, 1-2) on Friday and No. 20 Notre Dame (7-6) on Sunday. The Cats will need more big performances on both ends of the ball after excelling during the Spring Break stretch. NU averages 13.9 goals per game, an improvement after averaging 10.7 in 2017, and has the best scoring defense in the Big Ten, allowing just 9.3 goals per game. Nesselbush was named the Big Ten Offensive Player of the Week for her play during the stretch. The senior scored a career-high five goals for the Cats in a 14-10 win over Syracuse on March 26 and tallied 16 points over the course of four games, becoming the 20th NU player since 2002 to reach 100 career points. 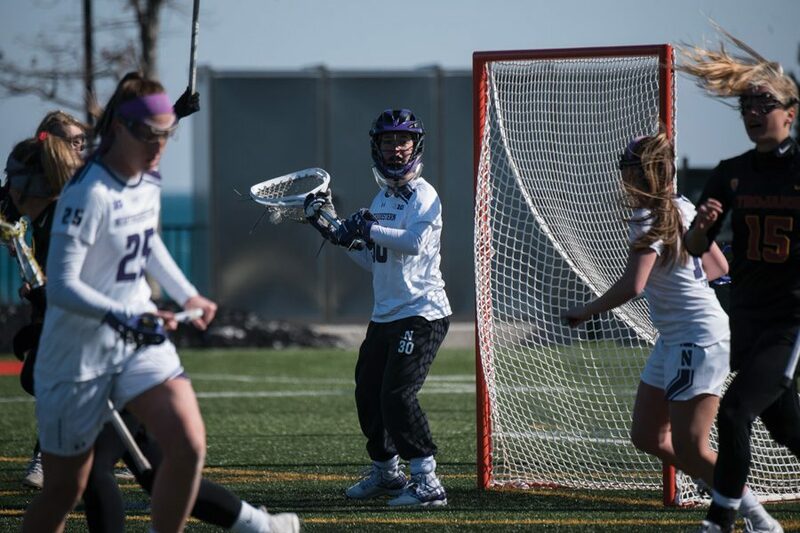 On the defensive end, redshirt freshman goalkeeper Julie Krupnick was named the Big Ten Freshman of the Week after collecting 45 saves in the four wins. Krupnick’s 14 saves against Johns Hopkins were the most for a Cats goalkeeper since 2007 and tied for the second-most in a single game in program history. The Buckeyes enter Friday’s game coming off an 18-10 loss to Penn State, which is unranked in the national poll but is ranked first in the Big Ten standings. The Fighting Irish took a 14-8 win against Michigan on Tuesday, days after they took No. 5 North Carolina to the wire but fell in a 13-12 loss. After this weekend’s home stretch, NU will go on the road to face the Nittany Lions and then play Rutgers at home before traveling to No. 3 Maryland to close the regular season. For now, the next two games are the priority.